“The tension grows to a peak when a storm knocks out the power right in the middle of the radio broadcast. Paranoia and bedlam follow, but as Sartre said, “hell is other people,” not Martians. The characters are well developed. You get a feeling of their pasts, without the use of too many flashbacks. There is plenty of mystery and suspense involved, which is slowly unraveled with remarkable pacing. Ain’t It Cool News reviewing The Broadcast. 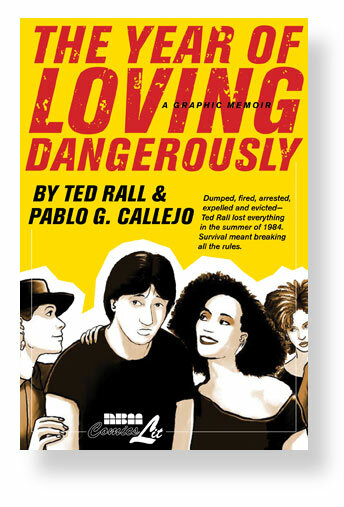 “When a book like LOVING DANGEROUSLY does come along, I have to read it twice because I am so taken aback by the fact honest-to-God literature is being produced in graphic novel format. “First of all, the Eurotica imprint of NBM Publishing has done a beautiful job of packaging this book together. Crepax is a master storyteller and he wields a lyrical brush. His style is beautiful with a nouveau tendency towards elongated bodies and necks especially…but not grotesquely so. The smoothness of his brush work just glides across the page in most instances and only in the most intense moments does he allow his work to get rough and scratchy. O is never less than always beautifully sexual. Crepax makes sure that her sexual beauty draws the reader’s eye even when the heart or mind might want to pull away from the events that are unfolding. heh, heh, we really pushed his buttons.